Spaced Out - "Slow Gin"
The Canadian band Spaced Out have quite a long history and this is the bands third release. Some of the members of the band go way back to the early 90’s in a band called Cortex. The band is not spaced out at all, but are a very focused and concise act. The band play complex heavy progressive jazz rock with impressive bass, guitar and drums with lots of solos and perhaps too many time and chord changes. The songs change all the time. This is the bands third CD since 2000 and from what I have read their best. The production and sound is quite excellent. If you are a fan of heavy instrumental progressive rock then you can’t go wrong with this. A very high quality music product! 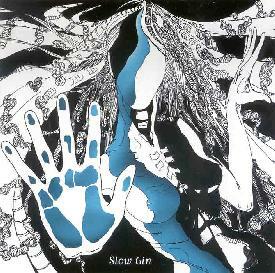 Slow Gin is distributed by Unicorn Records. You can visit their web site at: http://www.unicornrecords.com. Visit the Space Out web site at: http://www.spacedoutmusic.com.